When you look at a Balucheri saree for the first time, it is likely to make you experience several emotions depending on how much you love sarees. Then comes what I call the sucker-punch moment. It is that moment when you open up the saree and see its pallu. As you slowly take in its beauty, you begin to think; how on earth could anyone even dream up a concept like this!! The saree that delivers a sucker-punch! My Balucheri saree was a gift. As I opened the wrapping, I went through the usual glee, the oohs and the aahs. Next came the sucker-punch moment followed by the thought; how on earth could anyone even dream up a concept like this!! To date, I don’t really know how. But in my imagination, this is what I think happened. Here’s a little story I dreamed up. Once upon a time, long ago, there was a weaver. He was a gifted weaver of silk and could create the finest, most delicate brocades in the land. But he was unhappy. He was unhappy because he loved stories and actually wanted to be a story-teller. He had a head full of stories that he was just dying to tell. Unfortunately, there was no one around to listen to his stories. Soon their weight started to make him weary. He was afraid that his stories would tear him from inside and come tumbling out. He had to do something soon to save them and himself. And just like that, one day, he decided he would weave his stories, not with words, but by using the craft of weaving that he had been blessed with. He started weaving his stories on a saree. Long stories and short. About Kings and Queens. New stories and old. All of them. He wove his stories as frames, that ran into panels. And panels that became a long pallu. And that’s how the amazing Balucheri saree was born. The Balucheri saree is a glorious creation in silk brocade. 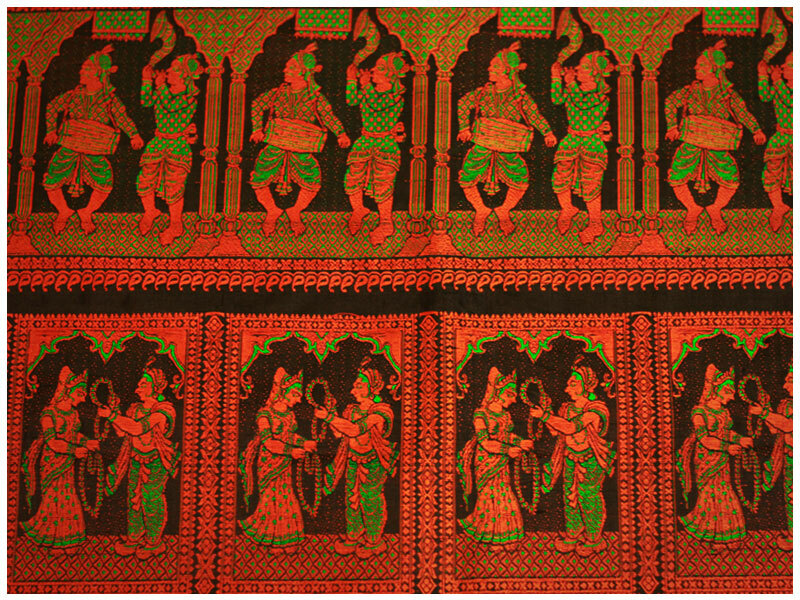 The heavily brocaded pallu, its most distinctive part, has unusual motifs like the figurines of the terracotta temples of Barangore, in Murshidabad. Sometimes the entire pallu is used to show a single scene. For example, a woman riding a horse, smelling a rose, her long plait in an upward swing. Other unusual motifs include a scene of women smoking the hukkah, a Mughal court scene and so on. Sucker-punch all the way isn’t it? The most popular sarees however, are ones depicting scenes from epics like the Mahabharat or Ramayana. 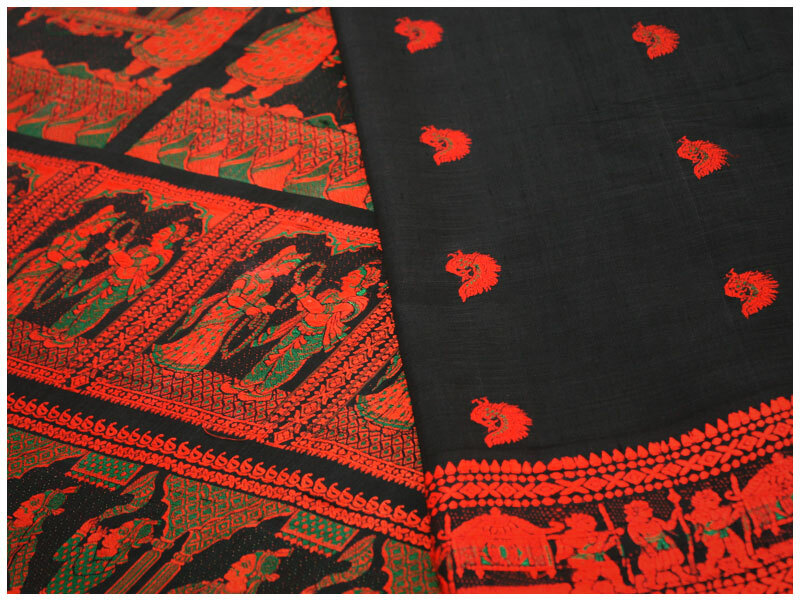 The Balucheri saree is made with fine silk. It is characterized by a really long pallu which is sometimes longer than a metre. The saree’s embellished pallu and borders use the complex jacquard weave similar to the Benarasi weave, except that this saree does not use any gold thread or ‘zari’. The intricacy of the Balucheri brocade, even way back then, was compared to the gorgeous Benarasi and the delicate Kashmiri handwork. 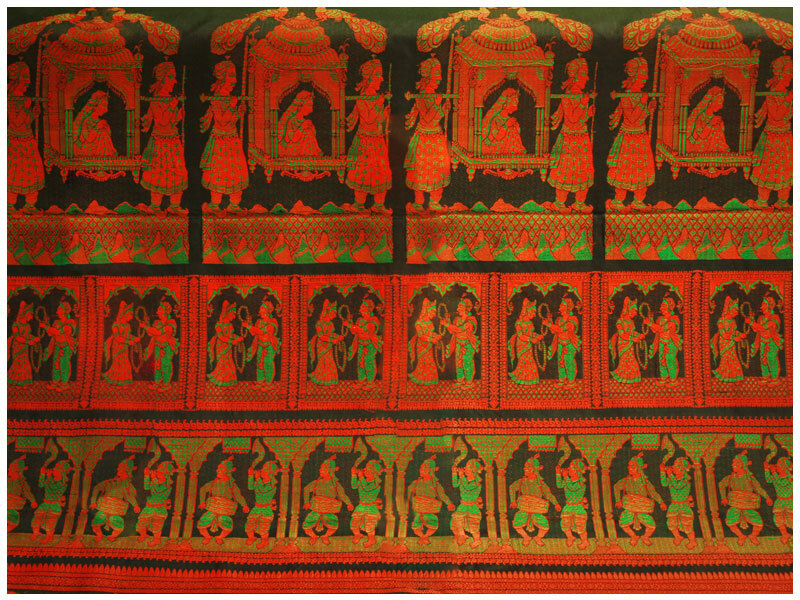 The pallu of the saree in the image shows panels depicting scenes of a wedding. The panels are made of scenes, and each scene is framed with an intricate border. Usually, most sarees also have a central motif around which the panels are organized. A distinctive feature of the Balucheri saree that surprises me is the weave uses just two colours, sometimes only one. When two colours are used, the figures in each panel are created using alternate colours to break monotony. 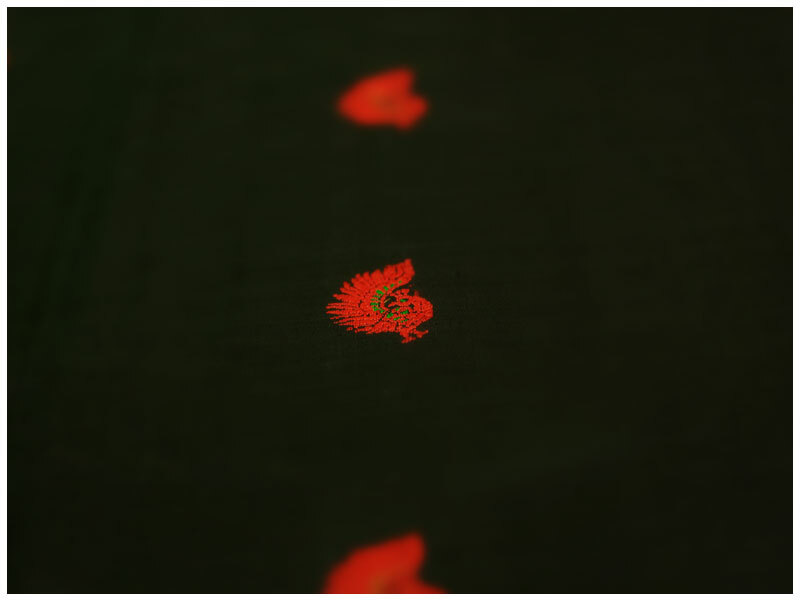 The small butis or motifs distributed across the body of the saree are also intricately woven. A simple Balucheri with repeating panels takes about 7-10 days to weave. A more complex design however may take 5 weavers about 2-3 months. I am overwhelmed not just by the beauty of this saree, but also the historical context under which it was created. This post would not be complete without a brief description of that history. The Balucheri saree originated about 200 years ago in Bengal, in a village called ‘Balucher’ situated on the banks of the river Bhagirathi. Nawab Murshid Quli Khan was the ruler of Bengal at that time. 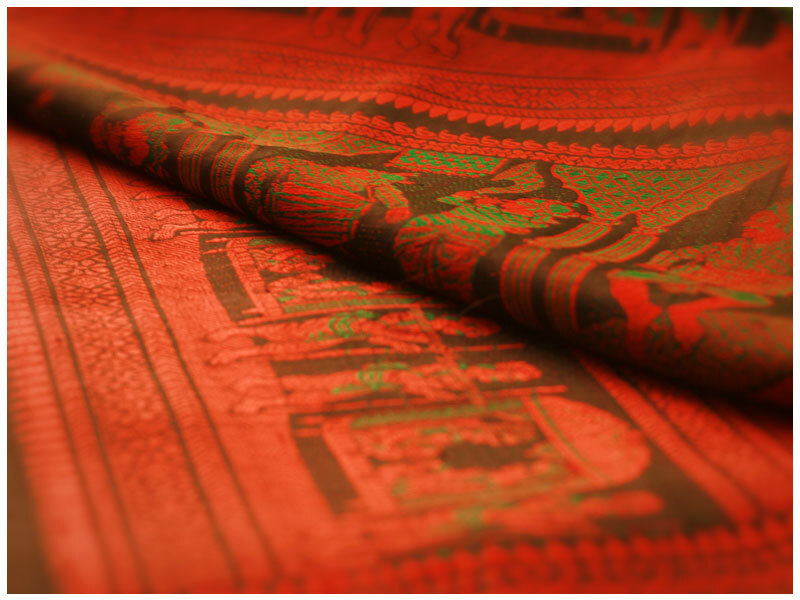 When the weavers of that region first created this saree, they received instant patronage from the Nawab. He was not only a great statesman, but also someone who encouraged art and its creators without any kind of caste or religious discrimination. Encouraged by his ready patronage, the weavers went on to push the boundaries of their own imagination, taking cues from their cultural environment and weaving it into the saree. This saree, like the Benarasi, was influenced by not just Mughal, but Persian aesthetics as well. Read more about Nawab Murshid Quli Khan to understand how a saree like the Balucheri, comparable to none other than a Benerasi, actually came about during his regime. Balucher is present day Jiaganj, in Murshidabad district in West Bengal. The weaving tradition and business has spread to other parts of the district of Murshidabad, which is known for its silk production. I wish that this beautiful creation, the Balucheri, will also enjoy top-of-the-mind recall like the Benarasi or the Kanjeevaram saree. The story of the saree with the story concludes, but story of the quintessential saree continues as the ‘B for…’ series is not over yet. This is great stuff, Punam! Congrats. Wonderful to read all about the different types of six yards that we drape, but do not give much thought to its genesis. Thanks for putting it all together & sharing it. Thanks Padmini. So glad you took the time to read the post. B —- for better and better with every Saree. Men also find it interesting to read. With so much information hope they start buying sarees too. Thank God they don’t wear. Thanks Nina. Yes good for us they don’t wear sarees! Great read. Thanks. I’ll add just one more bit of info — Balucharis in the days of yore were made only in one colour – the mayurkanthi — that is that beautiful 2 shade weave created with dark blue and bluish-purple (what we call Jaam rong). This was complementary to Bengal’s famous Nilambari. Also the tradition of storytelling in Bishnupur was further carried forward by craftspersons who used to make the famous Dashavatar hand-paintedplaying cards which used to be sets of a 100 or so depicting stories from the Puranas. Thank you very much Pritha. Also Jamini Roy’s art and the craftsperson/weavers art was all based on the the figures and motifs drawn primarily from the 17th century terracota temples of Bishnupur. thanQ Punam…..love wearing sarees n now will wear it with a unique pride….